1st T20I India vs New Zealand: Things look bright for Indian allrounder after he had to face the wrath over his comments on a popular TV show ahead of the limited overs series against New Zealand. 1st T20I India vs New Zealand: Things look bright for Indian allrounder after he had to face the wrath over his comments on a popular TV show ahead of the limited overs series against New Zealand. 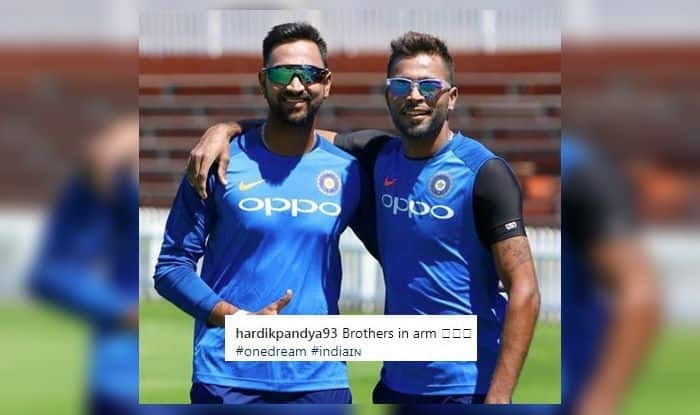 Hardik Pandya seemed to be in an emotional mood as he took to his social handle to share a picture of his brother Krunal Pandya on the eve of the 1st T20I at Westpac stadium. Hardik shared a picture of him along with his brother which was captioned, “Brothers in arm”. It seems like it was a dream of the brothers to represent the country together and they are overwhelmed as they are now getting the opportunity to be a part of the squad. Pandya came back to the squad after missing the first three ODIs after he was suspended. But, he came back strong as he proved his worth with the bat and the ball. He also showed his acrobatic skills on the field as he took a screamer to get rid of the Kiwi captain in the 3rd ODI. He seems to have come over all that has troubled him in the near past and looks like a more potent cricketer now. Both the teams will now lock horns in the 3-match T20I series. The first game is scheduled to be played on Wednesday (February 6) at Westpac Stadium, Wellington. India will start favourites despite Kohli not being there as he has been rested along with Jasprit Bumrah. Rohit Sharma would be leading the side against the Kiwis, who will also miss the services of Martin Guptill. Kohli was all praise for Hardik after his comeback where he took that catch and scalped a couple of important breakthroughs. Hardik seems to have cemented his spot as the fast bowling allrounder for the marquee tournament later this year, but his brother Krunal is yet to make an impression in the 50-overs format.